Three-time Olympian Eoin Rheinisch on adjusting to life after retirement and the love of the sport that never goes away. IT TOOK A while for Eoin Rheinisch to realise that it was time to retire. And even though the three-time Olympian still gets pangs for the buzz of competitive canoeing, a message from boxing coach Billy Walsh still rings in his ears. “I did one more year after London but I think, deep down, I was probably finished already,” Rheinisch, 35, said. 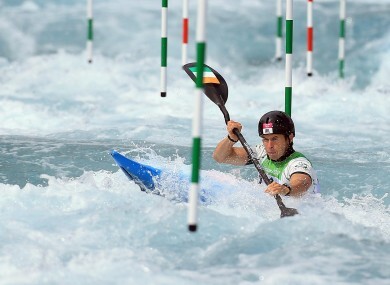 The Kildare native travelled to the 2012 Olympics with the hope of going one better than his agonising miss four years earlier in Beijing, when he was relegated out the medal places by the final canoeist on the final run. There was no fairytale in London — an unlucky penalty dashed any hopes of making the final, never mind a medal — but he carried on competing for another year, unwilling to let go. He’s still involved as a coach — “the soft landing” — but he has also moved beyond canoeing to work for the Institute of Sport’s athlete advisory service and with Sky Sports as a schools athlete mentor. The transition at the end of a sporting career is “pretty uncertain,” he said. “You’re doing something for 16 years and 12 of those years you’re full-time at it, and then all of a sudden it’s gone. The intensity is very different. I definitely battled a bit with what am I going to do next. Your identity becomes attached to what you do, so I was Eoin Rheinisch the canoeist and everyone knew me as that. All of a sudden when you take away the canoeist, well who am I now? The love of the sport never really goes away though, especially with another Olympics on the horizon. “For the last 12 years, you’re always looking at these four-year blocks and the only thing you see is what’s going to happen in those four years. “But I remember Billy Walsh once told me, ‘Don’t ever come back,’ because I think he had a couple of comebacks. What does a 21.5 stone vegan NFL player eat every day? Email “'You're doing something for 16 years and then it's gone. Your identity becomes attached to it'”. Feedback on “'You're doing something for 16 years and then it's gone. Your identity becomes attached to it'”.